Members of the Armed Forces of the United States can have unusual needs when it comes to protecting their license from traffic violation convictions or points. Law Office of Kenneth P. Carp know that traffic tickets can impact military members differently than civilians. Our senior attorney, Lt. Colonel Carp, retired from the Air Force where he was a Judge Advocate General (JAG). Lt. Colonel Carp knows the sacrifice of military members and is sensitive to how tickets need to be reported and how tickets are considered by supervisors and with security clearances. Our attorneys handle every ticket aggressively and will make sure you are kept informed of what’s going on with your case. Two attorneys at the Law Office of Kenneth P. Carp have been part-time prosecutors and one a part-time judge — our lawyers know the laws and know how to represent you. We have represented citizens in counties and municipalities throughout the state. Protect your license from points and let us serve you with the respect and dignity you have earned. Military members who serve deserve service. Call us at 636-947-3600 for a free consultation. 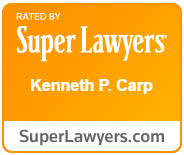 Contact us at 636-947-3600 or by e-mail and let the attorneys at the Law Office of Kenneth P. Carp represent you. We are lawyers who are sensitive to the needs of our military.